What does "raw" mean to you? It's been a month since Juliette and I participated in the Augusta Art Walk's Raw Space initiative, and we are still processing the stories we heard—both technically and in a figurative sense. On April 20th we met people from all over central Maine—and much farther afield—who came into our doctor's-office-turned-makeshift-cafe. Some of the mugs that were traded for stories during our Augusta pop-up cafe on April 20. The space was aptly called "raw": back rooms were filled with insulation torn from the exposed ceiling, the bathroom in what had been the waiting room was out of commission, and though our area was sufficiently clean, it certainly didn't scream hospitable. All of this made the experience all the more fascinating as far as I was concerned. A backroom filled with torn out insulation, as 269 Water Street is being prepared to transform into something new. I am drawn to ambiguity in language, and "raw" epitomizes the quality. A few senses of the word include: unprocessed (or uncooked), fresh, unnaturally or painfully exposed, crude, and undiluted. There is a connotation of transition in "rawness" that is also shared by the loaded definition of "home." Our project—with undoctored audio and handmade mugs—can be described as raw. The atmosphere of our "raw space" was therefore particularly conducive to having exchanges about home. It's here that I would like to provide some audio clips that we recorded from the many stories people we talked to about home told us. But aside from the volume of stories we are sifting through still, the volume sound-wise in the space that we shared with a musician (who was very cool and provided a nice vibe) resulted in not the greatest audio quality. The stories are transcribable—and will certainly appear in our book compilation at the conclusion of the project—but not a fair representation of the experience in their current form. In some ways, the rawness of the audio is a testament to the multifaceted experience we had. One thing I can say about the stories we heard and captured, though, is that they all felt raw in one way or another; open, fresh, sensitive. And as appreciative as I was of how forthcoming people we talked to were, I was surprised by the diversity of experiences that people had and how far they had come—either distance-wise or emotionally—to talk to us. 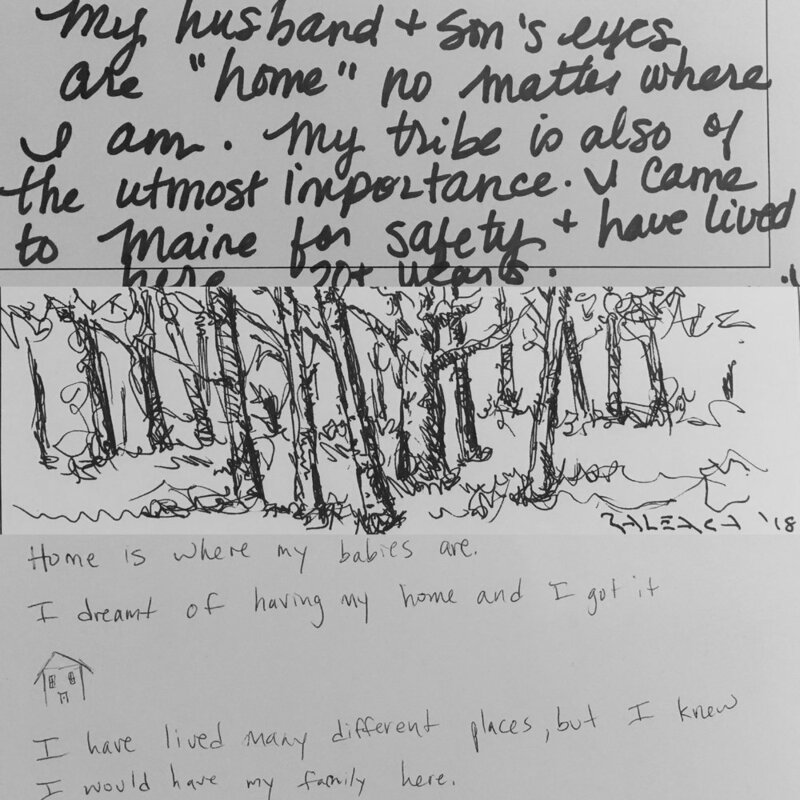 Another thing that made our experience particularly worthwhile was a new addition to our story-gathering efforts: we asked people to write or draw their experience of home while they sat down with coffee, tea, and/or a baked good we provided. The drawings and writing we received from people were also intriguing in their rawness. A handful of written responses and drawings gathered during the event. I think by any account, the heart of Maine's capital city has felt raw for a long time. But what struck me most while participating in the well-attended art walk was not the one of the woundedness I had become accustomed to growing up here; but rather the sense I had was of healing and hope—after all, we were set up in a former clinic on its way to becoming something new. Our handwritten sign posted to direct folks walking down Water Street into our pop-up cafe.